In December, less than a month after the American Studies Association adopted a resolution to boycott Israeli academic institutions because of what the ASA described as Israel’s persistent violations of the human right of the Palestinian people, its severe restrictions on the academic freedom afforded to the Palestinian people, and, in general, its continued violations of international humanitarian law, more than 250 presidents of American universities issued statements condemning the ASA resolution with some threatening to dissociate their universities with ASA. These presidents gave very little deference to a more sober and deliberate consideration of the full consequences of their support for Israeli academic institutions, nor for the Israeli institutions’ role in the oppression and dispossession of the Palestinian people. They gave very little thought to the Palestinian people, like so many western political leaders of the last century. Like so many western policy makers of the last century, they ignored the Palestinian people all together. These university presidents gave scant attention to the hardships imposed by the military occupation of the Palestinians in trying to educate themselves and their children. These university presidents might have considered Israel’s 2009 war on Gaza in which Israel destroyed or damaged 29 educational institutions in that narrow strip of land including the complete destruction of the science unit at the University of Gaza, the destruction of the agricultural building at the University of Al-Azhar, and also the destruction of UN built and supported schools as well as an American built and funded school. 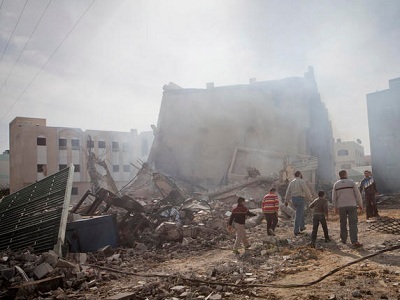 All in all, during Israel’s 2009 assault on Gaza, the Israeli military destroyed or damaged just short of 50,000 homes leaving 100,000 people homeless, while killing 1400 people of Gaza who, like 1.7 million others, were trapped inside a 28 by 6 mile area bounded by an electrified fence on the east, north, and south, and a naval blockade from the west. In June of 2009, in the aftermath of Israel’s Operation Cast Lead, former President Jimmy Carter visited the Gaza Strip and spoke briefly describing the destruction of the American school with Israeli and American bombs. The video also show him standing on the jamb of his SUV door and to taking pictures of the rubble. If one looks closely in the video, one can see part of the name of the school and the word “American” still visible in the rubble. I have heard the former president say that he had been invited by some faculty persons to speak at several American universities only to be told by their presidents that it would not be a good idea, or that it was not a good time. Carter declined to name the schools. The Protection of civilians in time of war has been a central part of international law since the 1899 Hague Convention, the first international convention restraining state action on the matters of the conduct of warfare and has been reaffirmed since in international law. In fact, many municipal structures were destroyed by Israel during the 2008-9 winter assault on Gaza, even the prison in Gaza city, as well as municipal police instillations. One with whom I am in email contact who lives in the Gaza Strip tells me that he estimates that he has heard perhaps 1000 sonic booms in the past year or so. This averages, as one can quickly see, to about 3 a day. Supersonic aircraft induced sonic booms can extremely loud and disruptive. Gaza children have shown high incidences of bedwetting, nightmares and other signs of trauma according to psychologists who have worked with these children..
By the end of November of 1947, despite 50 years of land purchases, Jewish ownership of the land of Palestine totaled no more than 6%. By the end of the year 1948, the Israeli forces had occupied 78% of mandate Palestine. 531 Arab villages and 11 urban neighborhoods were either destroyed or evacuated of its Arab populations generating a wave of from 750,000 to 800,000 Palestinians refugees. Most of those Palestinian not externally displaced were internally displaced and subsequently subject to military law and rule until 1966. This ethnic cleansing was carried out in accordance with a fairly detailed plan, Plan D, or Dalet, distributed by David Ben Gurion to his military commanders in March of 1948, two months before the introduction of any regular soldiers of a surrounding Arab state, which was May 15. In fact, by that date about half of the 750,000, or so, Palestinian refugees had been generated. The Palestinian people lost everything only to find refuge in tent refugee cities set up by the United Nations; their houses, their fields and orchards, their businesses, their banks were looted or stolen. The university presidents might be especially interested to know that the Jewish forces looted at least 70,000 books from both private Palestinian’s libraries or from public libraries. This is link to a very well done and interesting documentary on the looting of Palestinian owned books, which I hope the reader will take time to view. Sharon was not finished. In 2002, Sharon invaded all the cities of the West Bank, except Jericho, destroying the buildings that housed the Palestinian Authority, and partially destroyed the Muqata, headquarters of Yasser Arafat, and leaving him under siege where he was to spend the rest of his life. Sharon’s forces closed down Orient House in East Jerusalem looted the records and archives housed there by the Palestinian Authority. Nor does the Israeli school system spare their student the state propaganda of the general type one finds in the histories of the fascists regimes of pre-World War II Italy and Germany. “Under the Likud ministries of education, in cooperation with a cohort of academics, many of whom hailed from the national religious Bar-Ilan University and its satellite, Ariel University, in the occupied West Bank, the neo-Zionist interpretation of the idea of Israel constituted the ideological infrastructure for the official educational system. The neo-Zionists produced several educational kits (textbooks, curricula, and so on) which would have the power to impact the next generation of Jews in Israel. These kits could produce only one type of graduate: racist, insular, and extremely ethnocentric. The message that came through clearly, as found in research conducted by Daniel Bar-Tal of Tel Aviv University and , more recently, by Nurit Peled-Elhanan of Hebrew University, is to fear the Other inside and around you – the Other being the Arab world around Israel, the Palestinian neighborhoods, the Palestine citizens inside Israel, and non-Jewish immigrants. A good example of that sort of thing is the school textbook titled, Those were the years – Israel’s Jubilee, which covers the state’s chronicles since its foundation since 1948. The Palestinians hardly figure in the book – they are not mentioned with regard to the 1948 war, or as citizens of Israel under a military regime up to 1966, or as an occupied population in the West Bank and the Gaza Strip since 1967. The presence of Palestinian refugees is something the readers will not know about. They will only become aware of the existence of Palestinian terrorism, which emerged sometime in the 1960’s for unknown reasons. The militarization and the establishment of an indoctrination regime within the state education system is reminiscent of the Italian and German regimes of pre-World War II. In fact, such a superpatriotism and a supernationalism is, what I understand to be essential characteristics of fascism. The latter concept has a lengthy history, but probably reached its pinnacle in Italy and Germany under Mussolini and Hitler. On January 22, the Israeli Defense forces invaded the Abu Dis campus of Al Quds University, on the eastern slope of the Jerusalem hills, fired tear gas into the campus along with rubber bullets and injured about 100 students or faculty who suffered from either tear gas inhalation of from being hit with rubber bullets. I wonder what the 250 university presidents would think if their campuses were invaded by an occupation army troops injuring a hundred students and faculty. 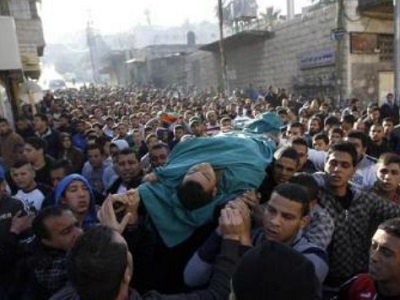 The Palestinian people are vulnerable people, an unwanted people, in the way of an expansionist Jewish state which is a European colony which established itself in the Middle East in the early half of the 20th century with the intention of dispersing the Palestinian people from Palestine. The Zionist movement has pretended throughout its existence that the Palestinian people, though they were sometimes recognized as occupants of the land of Palestine, did not really exist in any substantial sense. Nor were they regarded as a distinct people but rather were part of an amorphous undifferentiated Arab sea of humanity. They have been the objects of numerous intermittent massacres Of Palestinians by Jewish forces from 1948 onward, the Sabra and Shatila massacre of two to three thousand defenseless Palestinians, mostly women and children, in the refugee camps of Beirut in 1982 was the most notorious, but by no means the only one. The Deir Yassin massacre of 1948 was the most notorious of that period, but was hardly the only one or even the largest in terms of numbers killed. Every year the Interdisciplinary Center Herzliya, an Israeli university near Tel Aviv publishes a report on the state of the nation based on presentations given to them by the leading politicians, generals, and strategists and is commissioned by successive Israeli governments. Each year the report contains a recommendation for the transfer of Palestinians from Israel if the Palestinian minority should ever, due to a higher birth rate, double their percentage of the population from just over 20% to 40%. According to the Jerusalem Post, in November of 1989, Mr. Netanyahu, then Deputy Foreign Minister, told an audience at Bar Ilan University, that the government had failed to exploit internationally favorable situations, such as the Tiananmen Square massacre in June of 1989 when world attention and the media were focused on China, to carry out ‘large scale’ expulsions at a time when ‘the danger would have been relatively small’. Later, when Netanyahu denied making these statements, the Jerusalem Post produced a tape recording of this speech. A war with Iran would then have a double attraction for Netanyahu and his coalition. Israelis generally regard the Palestinian minority in Israel as a fifth column and a threat to the Jewish nature of the state. The vulnerability and precariousness of the Palestinian people was not a consideration for the 250 university presidents. Nor did they understand that those who came from Europe to settle in Palestine, and form their own state and destroy the Palestinian people, as a people, were the victimizers, not the victims. If I am wrong, before I apologize I would ask that they write a letter to those institutions of higher learning, both their own and those of Israel, all so devoted to academic freedom and truth. I would welcome a letter expressing just a little concern for the humanity and the savage treatment Palestinians endure under the Israeli boot of occupation. I wouldn’t even require they back off their objection to the boycott. My spirits would soar, my bitterness over my country’s descent into crass materialism would ease, I would without doubt experience at least a whiff of hope for our country if these learned men would just stand straight and approve Bill Martin’s document of particulars. Unfortunately in my country of Australia the government is following a strong Israel right or wrong policy, in concert with the Israel lobby here. This is mirrored in the lawsuit being conducted against a Sydney University academic who, involved in the BDS movement, declined to sponsor an Israeli academic for a position at the university.